Dickerson is inspired to continue working out and stay healthy by the words of his father, Kary Dickerson. ”All that you do, do with your might, things done by halves are never done right,” Dickerson recited. “My father said this to me on a daily basis,” he added. The Expo will also feature local success stories from people in the Dallas-Fort Worth area who have broken bad habits and improved their health or lost weight with the help of Fit and Faithful Living (FFL). 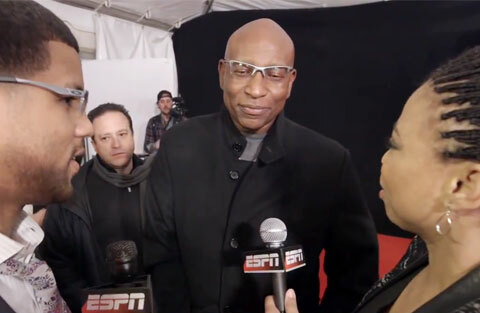 Watch the following video where Hall of Famer Eric Dickerson speaks with Michael Smith and Jemele Hill on Feb 2, 2014 about the keys to a good Super Bowl party and more. Dickerson is widely considered to be one of the greatest running backs in NFL history. He played for the Los Angeles Rams, Indianapolis Colts, Los Angeles Raiders and Atlanta Falcons. By 1989, he had set a new NFL record with 7 straight seasons of more than 1,000 yards rushing. In 1990, he moved past Jim Brown into third place on the NFL career rushing list behind Walter Payton and Tony Dorsett. He was a six-time Pro Bowl selection and was inducted into the Pro Football HOF in 1999. If you would like to book Eric Dickerson for a an appearance, contact Eric Dickerson’s agent for speaker fees or call 800.966.1380. .